This procedure is based on a collaboration of information from the forums, the Ford TSB and personal experience. I’ve only included what I feel is relevant in order to refill the system properly as quickly as possible. The general concept here is that air will accumulate at the highest point in the system which is the crossover tube. 1) Car must be parked level or on a slight incline with the front higher is even better. 2) Remove the radiator reservoir cap and crossover plug. 4) Get a funnel and wrap some tape around the tip in order to make a seal with the crossover tube opening. Screw the funnel down into the crossover threads until the funnel seats in firmly. 5) With the reservoir capped, continue adding coolant at the funnel until the funnel fills up an inch or two. 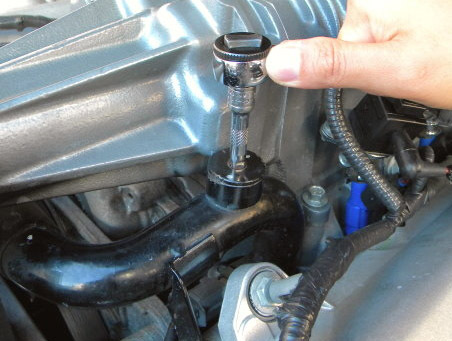 Squeeze the upper radiator hose a few times to force air pockets out of the piping. 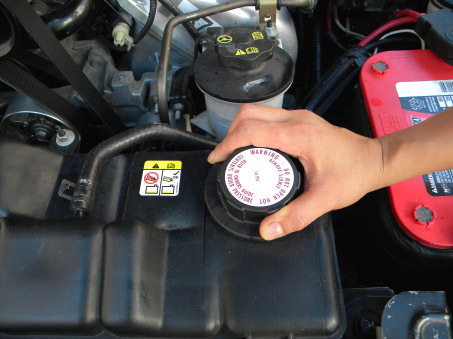 7) Shut off the engine but be ready to add coolant because the level in the funnel may drop as soon as you do so. Quickly unscrew and remove the funnel, top off the coolant and reinstall the crossover plug only snug. 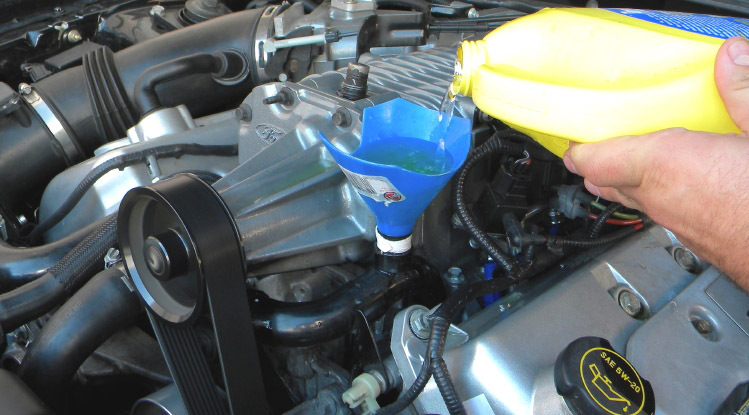 (This is done to keep coolant from being expelled because stagnant coolant in the engine becomes heated and starts expanding again) A common mistake is to run the engine too long which creates excessive heat and, instead of dropping, the coolant level rises in the funnel when the engine is shut off. If this happens just reinstall the plug quickly to minimize coolant loss. 8) After 40 min to an hour the engine will still be warm. Slowly remove the crossover plug but use caution because there may still be a little pressure in the system. Top off the coolant again but this time do not reinstall the plug. 9) After 3 to 5 more hours the engine will be completely cooled down and you will need to top off the crossover once more. Reinstall the crossover plug then verify that the reservoir is full. DO NOT OPEN THE RESERVOIR CAP WITH THE CROSSOVER PLUG REMOVED. 10) You may drive the vehicle normally. Make sure the engine reaches full operating temperature. Best to do some highway cruising and/or the engine should see some mid-rpm speeds at minimum. Copyright Reische Performance Products © 2019. All Rights Reserved.